The American Coot is not a duck, but a close relative to the Sandhill Crane. It’s a plump, chicken-like bird with a rounded head and a sloping bill. Their tiny tail, short wings, and large feet are visible on the rare occasions they take flight. Coots are dark-gray to black birds with a bright-white bill and forehead. The legs are yellow-green. They have a small patch of red on the forehead. 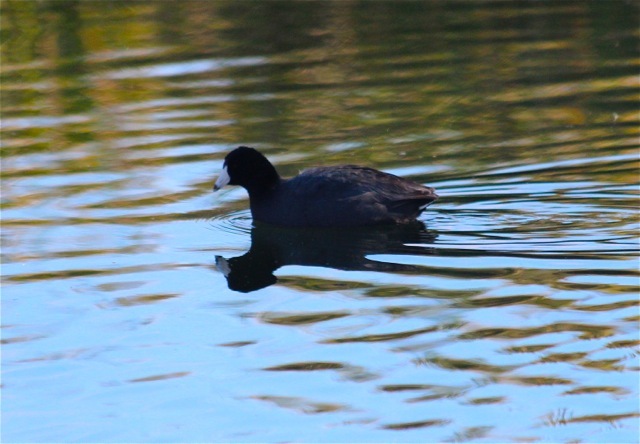 Coots eat aquatic plants on almost any body of water, such as our San Juan Creek. When swimming they look like small ducks (and often dive), but on land they are chicken-like, walking rather than waddling. An awkward and often clumsy flier, the American Coot requires long running takeoffs to get airborne. Photo courtesy of the Jim Serpa Photography Collection.